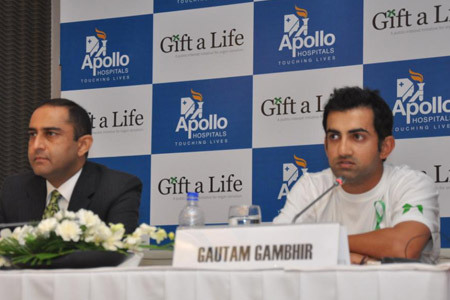 Gautam Gambhir, one of India's top cricketers, launched ‘Gift A Life’ initiative at a Press Conference in the capital today. The initiative along with its website is supported by the Apollo Transplant Institutes, to encourage people to take a pledge for donating organs to save countless lives in the process. The mission of ‘Gift A Life’ is to ensure that no person in India dies for want of an organ. This public awareness initiative aims to bring together information and awareness on the issue of organ donation. The website endeavors to start and then sustain a movement on organ donation and awareness. Taking the pledge, Gautam Gambhir said, “Thousands die every year for want of organs and I feel through initiatives like ‘Gift a Life’ we can do society good by bridging the gap. I appeal to the media to create awareness about organ donation. I would like to urge everyone to make this decision to donate their organs." Leading specialists from Apollo Hospitals were present at the Press Conference showcasing their support towards the initiative. Shortage of donors and organs has impeded the necessary thrust required to save more lives. More than one lakh people need replacement treatment for their ailments and living donors suffice only a fraction of the demand. ‘Gift A Life’ would like to encourage everyone to pledge to donate their organs simply by signing up on the website- www.giftalife.org. Indraprastha Apollo Hospitals, India’s first JCI accredited hospital, is a joint venture between the Government of Delhi and Apollo Hospitals Enterprise Limited. Commissioned in July 1996, it is the third super-specialty tertiary care hospital set up by the Apollo Hospitals Group. Spread over 15 acres, it houses 57 specialties with more than 300 specialists and more than 600 operational beds, 19 operation theatres, 138 ICU beds, round-the-clock pharmacy, NABL accredited laboratories, 24-hour emergency services and an active air ambulance service. Apollo Hospitals Delhi has the leading programme in kidney and liver transplant in the country. The first successful pediatrics and adult liver transplants in India were performed at Indraprastha Apollo Hospitals. The hospital is at the forefront of medical technology and expertise. It provides a complete range of latest diagnostic, medical and surgical facilities for the care of its patients. The Hospital has introduced the most sophisticated imaging technology to India with the introduction of 64 slice CT and 3 Tesla MRI and Novalis Tx. Indraprastha Apollo has also pioneered the concept of preventive health check programmes and has created a satisfied customer base over decades. The Hospital has been consistently ranked amongst the best 10 hospitals in India by The Week survey for the past few years.